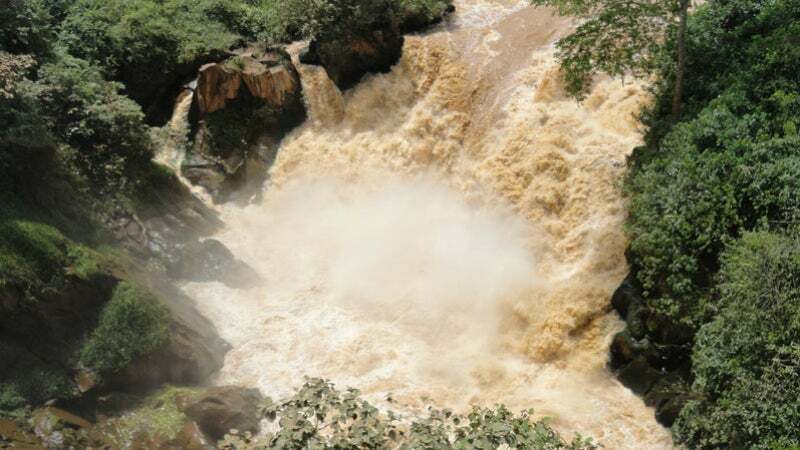 The Regional Rusumo hydroelectric project is being developed on the Rusumo Falls located on the border of the Republic of Rwanda and United Republic of Tanzania. The power plant features a run-of-the-river design with a two-lane road on top. Downstream view of the River Kagera on which the hydropower plant is being developed. The Regional Rusumo hydropower project is being jointly developed by the Republic of Burundi, the Republic of Rwanda and the United Republic of Tanzania. Regional Rusumo hydroelectric project is a hydropower plant planned to be developed at the Rusumo Falls on River Kagera located at the common border of the Republic of Rwanda and United Republic of Tanzania. The Republic of Burundi, the Republic of Rwanda and the United Republic of Tanzania are jointly developing the 80MW hydropower project under an agreement signed in February 2012. A new company named Rusumo Power Company Limited (RPCL) has been formed to develop the plant. Each of the three countries owns an equal share in RPCL. The $468.6m project reached a major milestone in November 2016, with the signing of the civil, hydro-mechanical and electro-mechanical contract packages. Groundbreaking for the start of construction is expected to take place in January 2017 with completion of the project scheduled for 2018. The World Bank approved a loan of $340m for the project in August 2013. The loan liability is being divided equally among the governments of Burundi, Rwanda and Tanzania. In November 2013, the African Development Bank Group (AfDB) provided a $97.3m grant from the African Development Fund and the Nigeria Trust Fund (NTF) for the project. AfDB is providing an additional $16m grant from the EU-Africa Infrastructure Trust Fund. Additional financial assistance is being provided by the KfW Development Bank (Germany), the European Investment Bank, Agence Française de Développement (AFD France), Swedish International Development Cooperation Agency (Sweden) and others. The power plant features a run-of-the-river design, thereby eliminating the need for constructing a reservoir, and minimising social and environmental impacts. It will include a concrete gated dam with a height of 12m and a spillway structure with three water passages. The passages will be equipped with three radial gates, each measuring 9m-wide and 9.5m-high. A two-lane road will be built on top of the dam. The water intake and headrace tunnel of the plant will be 11m-wide and 14m-high and feature a shotcrete and rock bolts support system. A concrete-lined vertical surge shaft with a diameter of 8m and a surge chamber with a diameter of 41m will also be part of the plant. The power house of the plant will include three vertical axis Kaplan turbines and three 30MW generators with 12kV output voltage. It will be located on the southern side of the Kagera River bank in Tanzania. The plant will include a 260m-long diversion canal with a width of 17m and a 250m-long tailrace canal with a width of 40m. A 220kV substation switchyard is also part of the plant and will be located on the northern side of the Kagera River bank in Rwanda. Construction of the project has been divided into a number of components comprising civil works, mechanical and electrical works, social and environmental impacts mitigation and project supervision. The civil works component is expected to cost $155m and will include works such as excavation, tunnelling, intake works, access roads, diversion / power canal works, spillway construction and development of site facilities. The $126m mechanical and electrical works component will include installation, testing and commissioning of hydro-mechanical equipment, turbines and generators, substation, power complex and communications equipment. The project also includes a $22m social and environmental impact mitigation plan, under which environmental and social management and resettlement will be implemented. The $37m project supervision component includes procurement, design, construction, interface management and preparation for operation and maintenance. "The project also includes a $22m social and environmental impact mitigation plan, under which environmental and social management and resettlement will be implemented." Three 220kV transmission lines are planned to be constructed to connect the power plant’s substation with three centres within each country. A 161km-long transmission line will be built from the plant to the Gitega centre in the Republic of Burundi. A 98km-long transmission line will be built to the Nyakanazi centre in the Republic of Tanzania and a 119km-long transmission line will be built from the power plant to Shango and Bugesera in the Republic of Rwanda. The civil works contract has been awarded to the joint venture of CGCOC Group and Jiangxi Water & Hydropower Construction Company. The mechanical and electrical works component contract has been awarded to the consortium of Rusumo Falls Andritz Hydro and Andritz Hydro. SNC-Lavalin International carried out the feasibility study for the project. Artelia Eau & Environnement was contracted to provide detailed design services. Lack of access to electricity is a major constraint for development in the region. Just 4% of the population in Burundi currently have access to electricity, followed by 13% in Rwanda and 15% in Tanzania. The hydropower project will supply electricity to the three countries and aid in the development of the region. The project will not only generate low-cost renewable energy but also generate a number of jobs during the construction and installation. In addition, it is expected to promote economic activities and attract private sector investments in the region. Energy Capital is an engineering company, specialising in power generation and similar engineering activities. Quality by precision and progress with tradition - for almost 80 years, SCHERZINGER Pump Technology has kept to this principle.